Why do they think they're better than everyone else? This is an unusual viewpoint when you stop to think about it because the entire concept of veganism is the desire for fairness and equality for all - the polar opposite of superiority. I don't think I'm 'better' than anyone, human or animal, which is why I don't pay people to kill animals for me any more than I'd pay them to kill humans. Indeed, what could be more 'superior' than needlessly killing more than billion animals every week just because we like the taste of their flesh? When looking more closely at the 'vegans think they're superior' claim it is worth considering the difference between thinking I'm better and thinking my choices are better. You and a friend discover a man who is hurting a puppy and plans to kill it. The man has already cut off the puppy's tail and ripped out his testicles and is about to slit the puppy's throat. 1. You intervene. You try your best to help and to stop the puppy from being killed. puppy. The whole situation is just too distressing to be a part of. 3. You join the man in helping to hurt and kill the puppy. Let's say (as most likely would) you choose option one and try to help the puppy but that your friend chooses option number two. Irrespective of what the pair of you are like as individuals (you may both be kind, intelligent, generous and both be genuinely good people) you made the ﻿better moral choice in that instance. You are not suddenly superior to your friend because of this, and your friend is not suddenly a bad person. But in that one situation in your life you made the better ethical decision, the decision to do the very best you could to help stop an animal from suffering. one is the better moral choice. Does doing this make you a terrible person? Of course not. But it does mean you're not making the very best choices you can, choices that most likely align with your own moral values anyway. 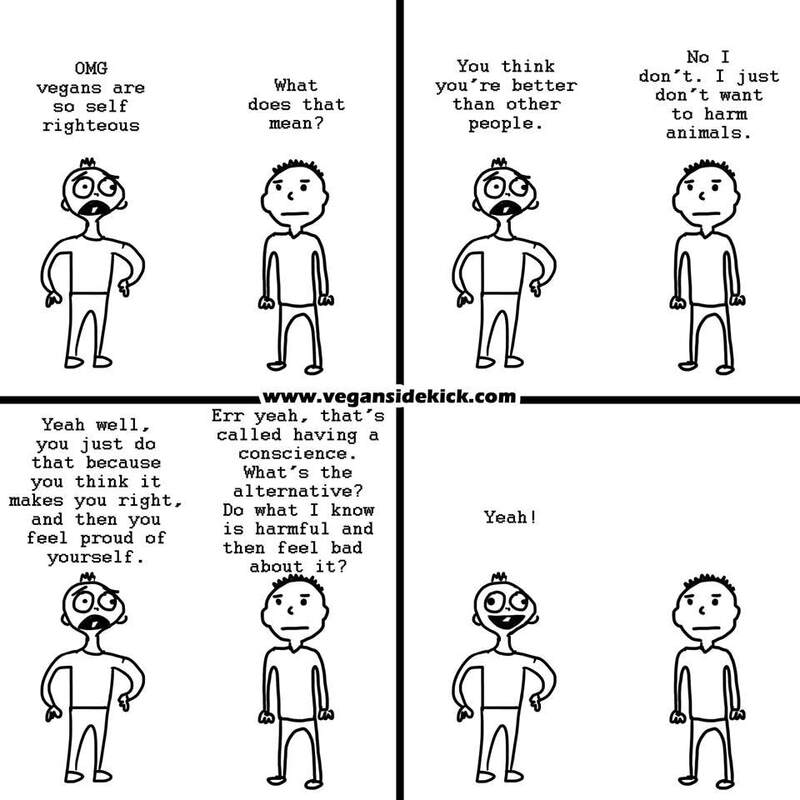 So next time you hear someone say it's wrong to hurt, kill, dismember and consume animals, ask yourself why they come across as 'superior' to you. Because it's absolutely not that they think they're a better person and more likely because, deep down, you simply understand that they're making the better choice. upon tens of thousands of piglets without anaesthetic, each and every day.